Het verhaal van de houten iPad stand. The Dutch Simon Blazer is 75 years old. He’s got two right hands. But no iPad. 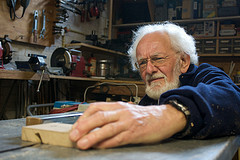 Even so, when a friend asked him to design and build a wooden iPad Stand he was fascinated. 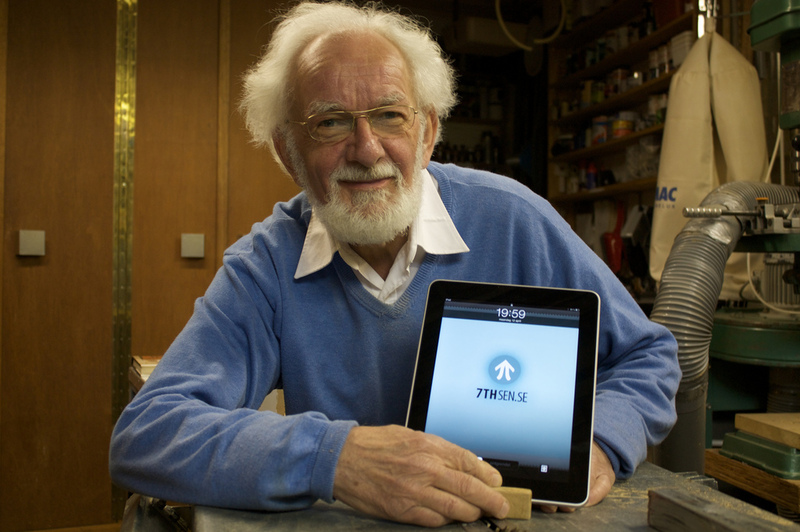 Dutch ingenuity, combined with some good friends made this Dutch grandpa the iPad grandpa. Within two days the blogpost was picked up by the main technology website in the world, Wired. Shortly followed by CrunchGear and The Unofficial Apple Weblog (which is a huge thing for an Apple related product). The result was the Dutchmen had hundreds of interested people for the $5 iPad Stand. Now they had to actually go on and make hundreds of the $5 iPad Stands. 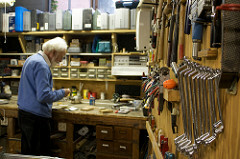 Simons woodshop became the $5 iPad Stand factory. A couple of days later a small mountain of $5 iPad Stands was ready. It did cost the gentlemen some actual blood, sweat and tears, but happy with the result none the less. Another friend, Annemieke Nieborg, helped the guys a whole lot by taking care of the shipping. In only a matter of days, something that started as a small practical solution, became a small business. Now shipping to over 20 countries worldwide and having sold hundreds, the Dutchmen are looking to grow their business even further. And the amazing thing? There were no meetings. No contracts, no paperwork. With the help of the internet in a mere three days the ball was rolling quite well. It’s an amazing adventure for the three Dutchmen ,and just goes to show what you can do with a piece of wood and some of that fine Dutch ingenuity. It even earned Simon and iPad. And the ‘iPad grandpa’ nickname. A sturdy, customisable and lightweight iPad Stand. Put your iPad in horizontally or vertical, with this stand you can. – And the Kindle too! – One fourth the size and half the weight of the bamboo version! If you’re one of the lucky iPad owners, you know you want to display your iPad in the best way possible. But on a budget. Enter the $5 iPad Stand (and nowadays the $9 Bamboo version!). We’re Dutch, so it’s made out of wood. To match our wooden shoes. And bamboo is a kind of wood, sorta. Original Dutch design, made with love, especially for your beloved iPad. Fully customizable to your liking. Would you like to buy one? You can. It’s cheap. Even the shipping costs are very reasonable. Wooden iPad Stand in government! If they’re good enough for Dutch Government, wouldn’t they be good enough anywhere? Hey, I can do this myself! iPad Mini or Air? 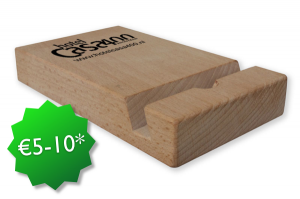 Get an Wooden iPad Stand Mini! Got an iPad Mini or iPad Air? Get an iPad Mini stand! Smaller, lighter and with anti-slip feet it holds your iPad Mini/Air perfectly. Still the same non-scratch, eco-friendly wood. Get it now! Ja, dan ben je best goed bezig! 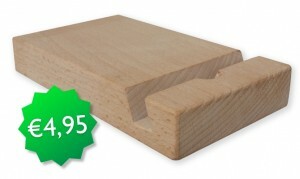 Je bedenkt en maakt een houten iPadstand, en voor je het weet wordt ie al gekopieerd! Whoei! Kijk maar: deze mensen van zuilopmaat.nlmaken exact dezelfde iPadstand, identiek aan de onze qua ontwerp en afmetingen, en noemen hem de iPaddock. En het leuke is, deze kopie is bijna twee keer zo duur! Nah! Hoe kunnen ze het ervoor doen, hè. Iedereen mag hem kopen trouwens hoor, deze duurdere ripoff. Vinden we niet erg. Of je maakt er gewoon ook eentje zelf! Ja!! Das hartstikke leuk en heus niet moeilijk; we hebben de bouwtekeningimmers online gezet. Maar ik zou het niet doen. 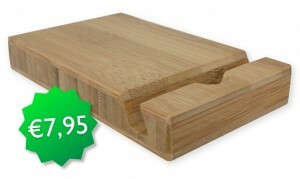 Ik zou hem gewoon hier kopen, de Wooden iPadstand. Voor 4 euro 95. Je moet dan wel genoegen nemen met het origineel, maar who cares. Wooden iPad Stands at Etsy Expo Dutch Design Week! 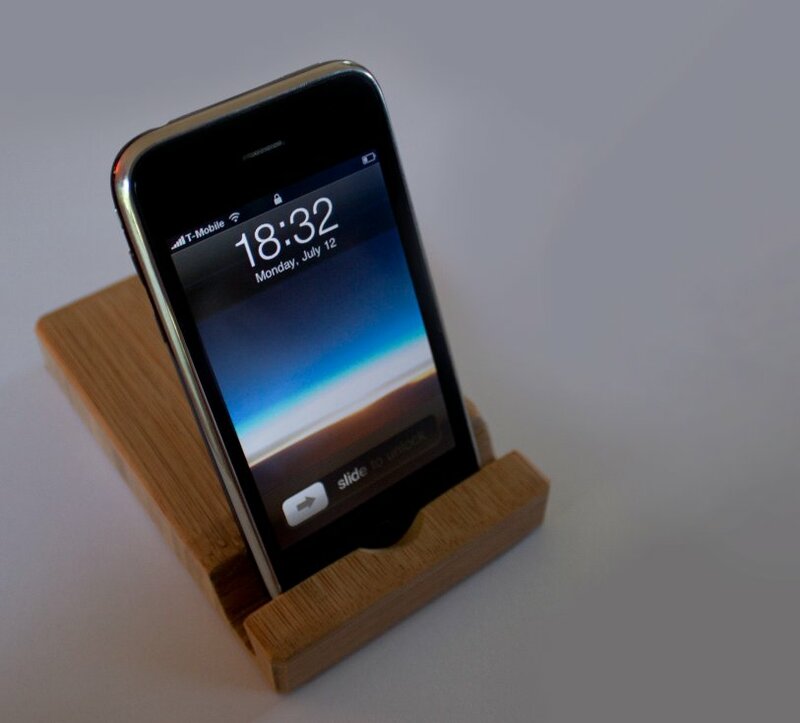 Our handmade Wooden iPad Stands are a beautiful product on Etsy of course. So beautiful we’re even at their Etsy Expo Dutch Design Week! How awesome is this? @riichard used two The Next Web Wooden iPad Stands to prop up his MacBook Air! Great stuff. Sideways ebook reading with the Wooden iPad Stand! Want to read an ebook comfortably in your bed? Put it in the Wooden iPad Stand sideways! Works perfectly, even with a Kindle (or iPad 1 or iPad 2). Try it out for your self! Thanks to Pascal Altena for emailing this picture. Do the Bamboo at MaxMe! Don’t they look cute together? The Original and the Do the Bamboo version side by side at MaxMe Groningen! 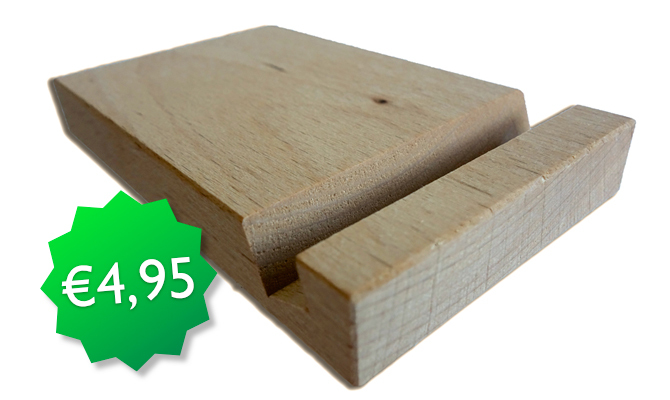 Our Original Wooden iPad Stands are as of now made from German beech. That’s not all. If you want to get technical about our wood, check this out: Sup.Color S2S; PEFC Mixed 70%, CU-PEFC-008566 KD. Apperantly it’s award winning, PEFC approved wood. We love our product. It’s eco, it’s pretty and it just feels right. Soon it will be in stores as well. Trouble is, we need packaging. We had some great design done (partly by us, partly by the talented @gertonderweg from RCG Groningen) and came up with something awesome. Trouble is, it’s expensive. We sell a $5 stand, we cannot afford $1 packaging. 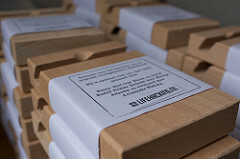 Maybe we can get prices down and only use it for our $10 Bamboo version, but we still need packaging. UPDATE 1: we need attractive packaging for in stores, that is the most important bit. Simpel. En briljant. Dit is de iPad stand die je moet hebben. Zet je iPad horizontaal of verticaal in de stand, neem de lichtgewicht stand overal mee naar toe en ontdek dat je niet zonder kan.
Dit originele Nederlandse product is met de hand gemaakt, van eco bamboe en bijzonder praktisch. De perfecte iPad Stand voor op het bureau of voor onderweg. Bright mag tien bamboe iPad stands weggeven. Vul onderstaand formulier in om kans te maken op deze mooie prijs. via Bamboe iPad stand | B R I G H T.
Will the $5 iPad Stand damage my beloved iPad? Not very likely. We tested our own iPad in the $5 iPad Stand for days without any damage. If however, you feel the need to slam your iPad in or vigorously grind it in the wooden iPad Stand, you will most likely damage your iPad. How strong is the $5 iPad Stand? Quite strong actually. From our facinating disclaimer: “ Of course we tested our own wooden iPad Stand for days, chucking it in bags and taking our iPad in and out. It didn’t hurt our beloved iPad or iPad Stand one bit. Can I charge my iPad whilst in the $5 iPad Stand? Yes you certainly can. Just put the iPad in the horizontal position and done. It is a $5 iPad Stand and not a dock, since you can’t put the usb-dock connector in the iPad when it’s vertical. We don’t really want to make a dock either, it would eliminate the possibility to place the iPad in landscape/horizontal orientation in the $5 iPad Stand. And we think a lot of apps will work great when the iPad is horizontally placed in the $5 iPad Stand. 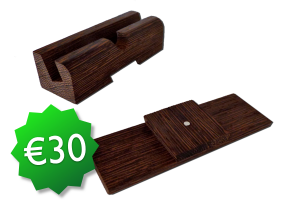 Do you offer other types of wooden $5 iPad Stands? Wauw, you must be a mind reader! Just what we are thinking, different kinds of wood. Amazing, just stay in touch and see different wood options in the near future! Where can you use the $5 iPad Stand? 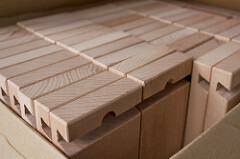 In the Flickr group Wooden iPad Stands showacase we collect $5 iPad Stand photos made by users. 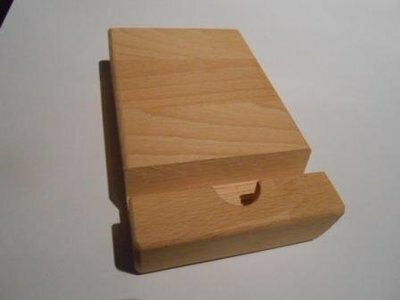 How, and why did you guys start selling wooden $5 iPad Stands? This is our story so far. And we’re sticking to it. Is there a patent on the $5 iPad Stand? Creative commons, as long as you mention our name, it’s ok.